Well, as you know we spent the summer sailing the Sea of Cortez and have visited some of the most magical and beautiful places on earth. Having visited so many amazing places it is hard to pick just five favoriates because each anchorage has its own special charm. Each time we get to a new spot I think, “Now THIS is my favorite place on earth.” Then we move to the next place and it’s even more beautiful. But, I decided on a top 5 and that’s what I’m sticking to for this article. So, without further ado, here we go. The anchorage as seen from the ridge line! This place is truly spectacular. There’s just no other way to describe it. The crescent shaped, crystal blue bay is met at the shore by a white sand beach which leads up to rocky cliffs extending high above the anchorage. There are several hiking trails on the island with one that leads up the ridgeline to the boulder covered peak. We hiked to the top where the views were astonishingly beautiful. The ridge line trail leading to the rocky summit. A look down on the east side of the island. The rocky beach on the east side of the island. There’s a huge salt pond on the island as well. It’s a pretty interesting sight if you’ve never seen such a thing. When you walk across it you hear a crunching sound that reminds me of traversing a snow covered field. Across the San José channel from the island is the Giganta mountain range on the Baja peninsula. The sunsets over the mountains are fabulous. Looking from the west anchorage across the San José Channel to the Giganta Mountains. View from the trail across the salt pond. It’s easy to see why this is one of my top 5 anchorages in the Sea of Cortez. From the amazing aqua waters to the hiking trails up to the rocky summit it is truly a wonderful place to spend some time. Caleta Partida is near and dear to my heart for several reasons including the fact that it is one of the first anchorages we visited upon my arrival in May. Dan and I spent five days in this beautiful anchorage one time an another couple of days a few weeks later. In the early afternoons the water was perfectly flat and beautiful. That’s when the sea turtles would appear and swim around the boat. I wish I had pictures of them but they don’t stay up long enough to get a snapshot. In the early evening the winds sweep through the “window” between the mountains and offer a cool breeze with which to enjoy the evening. There are several Méxican fish camps that dot the shore here. While we were there we would watch in the mornings as the pangeros would hop in their boats and head out to fish for the day. About the time the sun was going down they were coming back into the camps for the night. We have wonderful memories of this place and I sure hope to visit it again before we leave the sea. I even scattered some of my father’s ashes here. We have been doing that along the way. Dad loved sailing and adventure. He’d love this adventure we are on! Dan even marks a waypoint on our plotter so we will be able to create a map of the places he’s been with us. Caleta Partida is a definite “must see” for anyone cruising in the Sea of Cortez. For more pictures of our trips to Caleta Partida, Click Here. to be a blessing. As you can see above, on the beach is an all-inclusive retreat. The yurts are pretty cool to see and they even have a dog that roams the beach named Chaca. He was pretty sweet. When we landed on the beach with the dink he came running down barking his head off like he was some great attack dog. The minute he reached us he was as docile as a baby bunny. We enjoyed a few minutes with him until we were again inundated by bees! You see, the bees here are looking for water. That’s what they do in a place as arid as México. The reason we chose El Alacrán is because there is a resort there and they are likely to have water on the island which usually keeps the bees away from the boats. Well, fortunately the bees stayed on the island and left our boat alone this time. We had the entire anchorage to ourselves which is always a joy. Of course it’s fun to have cruiser neighbors too but there’s something magical about having an entire beach and bay to yourself. Aside from the seclusion and beautiful views there was the snorkeling. It’s been a pretty mild summer here in the sea so the waters haven’t been really warm and clear in a lot of places which kept us from doing much snorkeling. El Alacrán, however, had amazing snorkeling. On the north side of the anchorage there is a reef filled with sea life. We took the dink over there and anchored the morning we arrived. There were pangeros there diving for octopus. We never did see them actually get one but they had many on their boat. We spent a couple of hours exploring the beautiful reef before Dan decided he needed a break. He jumped in the dink and I was just a short distance behind him. Just as I neared the dink he said there was a sea lion about 50 yards away. He was in much deeper water so I was a little hesitant to swim out there on my own but Dan started the dink and followed me. OMG! I finally got a chance to swim with a sea lion! Can you say AWESOME DAY? It was a bull so I didn’t get too close but the fact that I was able to get within about eight feet of this amazing animal was so incredible. It truly made my day and my snorkel trip. Later that day we went fishing and found a tiny outcropping of rock where there were about a hundred sea lions. I so love these noisy, smelling beasts! The fishing here was awesome. The waters were crystal clear and of course, the fact that there were sea lions and I got to swim with one makes this anchorage completely worthy of being #3 on my list! in and then empties out when the tide goes down. The shallow water is crystal clear and it’s a great place to “ride the tide” on a float or swim noodles. You know, just enjoy a cocktail and cool off after a long, hot day? The estuary rides were a daily event during the time we stayed there. We spent a total of 11 days there on two separate occasions which should tell you how much we truly enjoy this special place. During one of our estuary rides a school of Golden Rays came swimming toward Dan. One of them brushed up against his leg startling him which caused him to jump out of the water rather abruptly. It was pretty funny. I’m not sure I’ve ever seen him move quite so fast. Apparently these rays like to come into the estuary and then as the tide goes out they ride with it. We saw them a couple of times. I was fortunate to get some awesome video of them swimming directly at me. When they got just a few feet from me they scattered. The picture to the right is from that video. Needless to say, the estuary experience is awesome indeed! So what else makes this place so special? Well, there’s the many wonderful cruiser friends we spent time with there…Randy & Jodi on SV Free Luff (To check out their blog, Click Here), Kirk and Kris on SV Linger Longer, Tom and Annie on SV Tappan Zee, Jason and Vicky on SV Volare, and Dave, Laurie and BD on SV Slipper. It was such a joy to spend time with and get to know so many wonderful people. The fishing at La Gringa was “off the hook” or should that be “on the hook”? We caught Sierra and Dorado and we ate exceptionally well. I’ve caught Dorado on big fishing boats before but never on a dinghy so this was a first for me. Dan and I fished just about every day and we never came back empty handed. Watching the Dorado go after the bait fish here was awesome! We even saw one chasing bait up the beach in just an few inches of water. Very cool! La Gringa is also the place where I experienced my first Chubasco. That’s certainly not one of the reasons it’s on my top 5. But, I did get to see firsthand what a truly capable and amazing sailor Dan is and I learned a lot about my own ability to remain calm in the midst of utter chaos on the water, so it wasn’t all bad. At just six nautical miles north of Bahía de Los Angeles where you can provision and get some wifi as well, this is one great anchorage. La Gringa is a special place and one I highly recommend to anyone visiting the area. I promise, you won’t be disappointed. 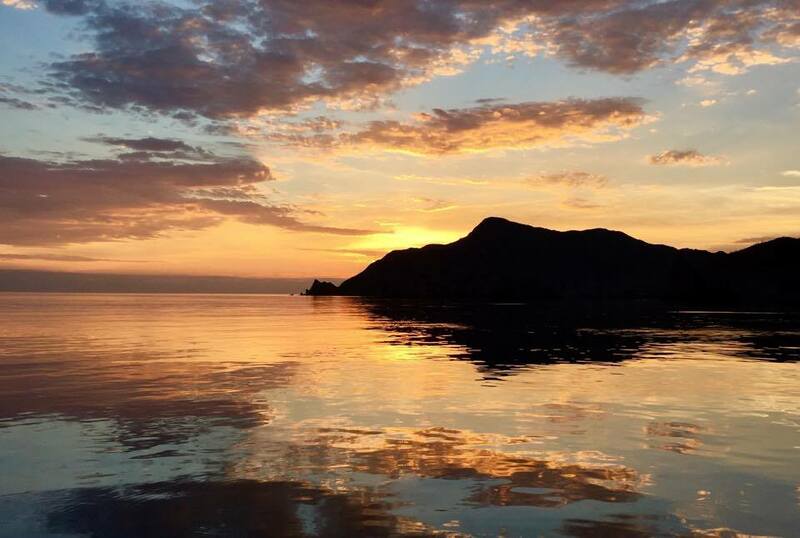 And now for Jilly’s pick for the #1 anchorage in the Sea of Cortez……. The guano covered pinnacle marks the entrance to my favorite place in the Sea of Cortez, Puerto Refugio! This astonishingly beautiful place is far north in the sea. Located 40 nautical miles north of Bahía de Los Angeles, this anchorage lies on the northern most tip of Isla Angel de la Guarda. It was our stopping point before and after Puerto Peñasco where we went to have the boat hauled and bottom painted. What I didn’t know when we passed this picturesque pinnacle was that the beauty that lies here is but a small piece of what was to come. Refugio is, without a doubt, the most beautiful and tranquil spot we visited this summer. When you pass through the entrance between the islands from the West bay to the East it is like you have entered another world entirely. As I stood on the bow pulpit looking for shallow rocks I was completely overwhelmed by the beauty that surrounded me. We were the only boat in the area which made it feel as if we were ancient explorers out discovering new lands. The ruggedness of the of the terrain was stunning and the colors, oh the colors! They went from vibrant shades of red and copper to soothing, cool shades of blue, green and grey. With each and every turn of my head I was seeing more colors and shapes and textures than my brain could comprehend all at once. And then, just when I thought it couldn’t get any better I heard it. What you ask? The loud barking of the sea lions on Isla Granito, a small island just a mile or so out from the anchorage. What could be better or more adventurous than anchoring in a spot that is only inhabited by wildlife? Oh yes, here we were and I was truly in heaven! There’s a reason I’ve been called Jungle Jilly most of my life. I LOVE animals and will do just about anything to get up close encounters with wildlife. I wanted to get on the island with the Sea Lions but Dan wasn’t having any part of it. After two days of begging and pleading with him he finally gave in. This was a truly awesome moment in my life. I’ll never forget being up close and personal with these guys! Just another reason Refugio is my #1 pick. The fishing here was also pretty awesome. Dan caught a ton of Cabrillo and even managed to catch TWO Trigger fish at one time! Now that’s something I’ve never seen before. We’d fish and explore by dinghy in the mornings and then come back to Dazzler for cocktails and a little relaxing in the hammocks in the afternoon. Refugio is one of those places where you could spend weeks and never see or experience all that is there. We only got a chance to spend six days there this summer but I can tell you this, it was six of the most incredible days of the past four months. Between the seclusion, amazing scenery, cool wildlife, great fishing and breathtaking sunrises and sunsets, Puerto Refugio has truly earned its place as #1 on my list of Top 5 Anchorages in the Sea of Cortez. If you get a chance to get here, do NOT pass it up! See More Photos Of Jilly’s #1 Pick…Puerto Refugio CLICK HERE! Bravo! Your #1 choice is mine also! I could have spent a couple of months there! Just love it! Wonderful description and pictures of your favorite places!!! Thanks. It was really difficult to narrow it down. This place is so amazing! I just love México!